Product Details - Material- Non abrasive material for the most persistent of the chewers, Use - Gently massages the gums and keeps tartar away, Non toxis and durable, Dimensions - 15 cm, Flavoured-Mint , Suitable- All Medium Breeds Dogs. 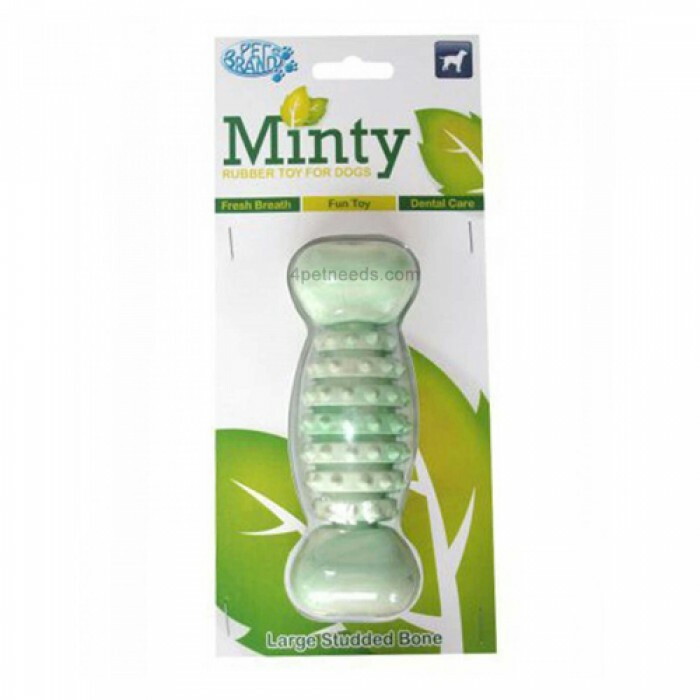 Product Information - The Pet Brand Minty Fresh Rubber Bone in medium size is a perfect toy for all your Medium breed dogs. This satisfies the urge of chewing in your dog. They can play with this toy for countless hours. This ball is made of fresh rubber that facilitates chewing and the addition of mint flavor ensures fresh breath at all times.The Medium Minty Fresh Rubber Bone Toy from Pet Brand help you to maintain the oral hygiene for your dog. It will help to massage the gums without abrasing them, thus increasing the blood flow in the gums. Regular chewing will promote healthier teeth and prevent the formation of any plaque and tartar. If you use it on a regular basis then you can maintain healthy and strong teeth for your pet while ensuring that he or she is enjoys their playing time. The toy is easy to maintain, if it gets dirty just wash it with water.